BRYAN EATON/Staff photo. 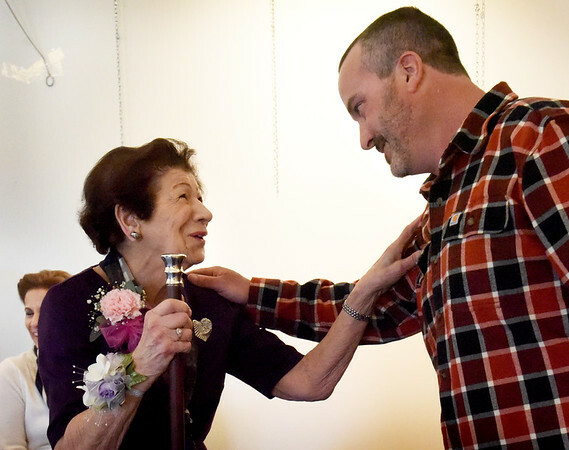 Newbury resident Mary Dollas, who turns 98 later this year, thanks Newbury selectman J. R. Colby after he presented her with the town's Boston Post Cane in front of about 40 friends and family at the Newbury Public Library on Thursday morning. Born in South Boston she and her late husband George lived in various places living many years in Salisbury. She had four children, and has 12 grandchildren and five great-grandchildren. She spent many years volunteering and just recently left the choir at Annunciation Greek Orthodox Church in Newburyport and also volunteered at St. Basil's kitchen crew at the church which provides meals on Mondays for those in need or seeking fellowship.